One Hour Photo, curated by Adam Good, Chajana denHarder, and Chandi Kelley, closes today at the Katzen in Washington, DC. Quoting from the website, â€œ[t]he premise of One Hour Photo is simple: project a photograph for one hour, then ensure that it will never be seen againâ€¦ Each work will exist only in the limited moments of perception, in the individual and collective experience, then memory, of the observers.â€� In conjunction with this project, Larissa Leclair asked each photographer to respond to the same three questions â€“ describe the photograph in three words, talk about the selection process, and thoughts on letting go of the image. The photographersâ€™ responses have been posted throughout the exhibition on the day their photograph was projected at the Katzen â€“ 26 days, 128 photographers. See the schedule of photographers here. The photographersâ€™ responses may provide a glimpse of the projected image, but they also reveal something about the photographers themselves. The last five photographers are Penelope Umbrico, Clayton Cotterell, Matthew Gamber, Ann Woo, and closing out the exhibition is Ruben Natal-San Miguel. Curator talk and discussion today at 2:30pm. Come and say farewell. How does one go about selecting a photograph that is good enough for an exhibition but that can never be seen again? The images I used for my piece in One Hour Photo already exist elsewhere, in some form, on the internet, and given the nature of the types of images, and the nature of the internet, I have unlimited access to new or similar versions of them, that represent the same thing. In contrast to the idea of the photographic edition (where each singular material print is the same as the others in the edition but limited in number), the mutability, ubiquity and replacability of digital images allows for a kind of regeneration to take place. It doesn’t matter if the specific arrangement of images that make up my piece are never seen again, because the work can be thought of as one moment in the life of an ever changing fluid project – an ongoing process of accumulation, re-combination, recontextualization, regeneration. What are your thoughts on letting go of this image? I asked these questions: Is the forced act of absence or erasure in a digital context inherently antithetical to digital representation, or as an artificial construct imposed on an digital image, could it point to fundamental issues inherent in digital representation? does it question what it is we ask of digital representation? So I didn’t think of it as letting go, but as a staged act that addresses some issues to be worked out – specifically, in my mind at the moment: the oddly dialectical paradox of a kind of presence of digital form (in its infinite multiplicity, synchronic ubiquity, and ephemeral immateriality) vs and a kind of non-presence of material form (in its finite singularity, immutability and localized specificity). I made my piece specifically for the show with an image I knew I wouldn’t use anywhere else. The image began to grow on me after making it, but lead to others working with a similar idea. I’m ok with letting it go. Some photographs exist as outliers, or as transitions between projects. However interesting these images might be, they are often never seen by others. If we did housecleaning more often, we might be able to reduce our personal collections to the ones that are most important to us. Do you miss me? (image title) The presence and the absence. Here today ….gone Tomorrow. Life is short, live it to its fullest. Larissa Leclair has teamed up with One Hour Photo to feature photographers from this exhibition. Read the initial post here. Today’s photographers are Lisa McCarty, Michael Kenny, Chris Davis, Katy Rossing, and Matt Austin. When submitting an image to any show I donâ€™t think in terms of quality, but what image do I feel strongly about and would best fit the concept. The knowledge that my image would be seen for one hour and then never again actually made me want to select something I wouldnâ€™t want to let go of rather than an image I was ok with never seeing/showing again. I saw it as a challenge to give away something that was truly meaningful me. Iâ€™m really excited. This is an experiment, and I can’t wait to see how I’m affected, how the viewers are affected, and eventually how the image changes in my mind as time passes. all data has a shelf life, some longer than others: there is no permanence. this photo has been sitting in a box for almost ten years, i am happy that it will have a moment to shine. the photo is of a truly fleeting moment in time – an unexpected event where a mantis hitchhiked a ride from College Park, MD, through DC, and left us somewhere around 14th and U St NW. I looked for a photograph that I thought captured something I found both quotidian and thought-provoking. Those qualities seemed to fit the bill. The photograph was taken spontaneously; I literally did not break my stride to photograph it as I walked by. So the image itself seemed like a lucky fluke to me, so I feel like itâ€™s somehow right to let it go this way. It wasn’t easy to choose. At first, I was sorting through images that I’d made a long time ago that I really liked at the time but never did anything with. I was thinking it would kind of ensure the idea of never using it again in a more formal way. But then after searching far too long for the “best image” of that category, the concept of swearing to never show it again interested me much more. The idea of challenging myself with that kind of discipline became far more appealing than choosing which image would best represent me to the public. I wanted the concept of saying goodbye to something to be embodied by the image that would then be embodied by the exhibition. The process of spending the time selecting the photograph was rewarding in itself, I was satisfied with that experience on its own. It feels good to do; I choose to interpret it as a kind of tribute or honor. The photograph was initially a mistake: an accidental double-exposure of my mom’s boyfriend Richie’s bed and snow falling on his front lawn. I made the images on the day that he passed away on January 25, 2010. I wanted to take the opportunity of the one-hour existence of the piece and use its impermanent dynamic to create a photographic elegy for Richie. Larissa Leclair has teamed up with One Hour Photo to feature photographers from this exhibition. Read the initial post here. Today’s photographers are Esther Hidalgo, Rodolfo Vanmarcke, Frank DiPerna, Osvaldo Cibils and Sasha Bezzubov + Jessica Sucher. I chose an image that I would never be able to go back and re-shoot, one that I found beautiful and enjoyed gazing at, one that I would have wished to print and preserve. With regard to the business of art, letting go of the image excuses me from having to think in terms of ownership and rights to reproduction–issues that are often in play for me as a photographer. Artistically, this project invited me to shift the way I perceive my work. My photographs are proof that I have been here and have acted. Yet the ephemeralness of this exhibition, by showing the work only once, is like wiping away my fingerprint after touching a glass. Each race is crucial. There are no small enemies, no small challenges. When I decided to participate in this project, I delivered grapes that were picked from a great harvest. I would never allow myself to exhibit something that is not “amazing” just because it will never be shown again. Each and every day in life we let go many things. The important thing is knowing what we win when we let go of something. This photograph will vanish between the walls of a museum, but not without passing through the visual registry that goes from the curators to the staff of the museum; and with luck, through the eyes of some visitor walking around the place. Knowing this, one way or another has already made the piece invincible in time… or at least invincible until those who saw it, no longer live. I chose an image that is more or less outside of the mainstream of what I normally do; Iâ€™ve often wondered what I might do with and this was the perfect opportunity. I like the concept of the show so letting go isn’t that hard, I lost an important negative in the street once that was hard. Larissa Leclair has teamed up with One Hour Photo to feature photographers from this exhibition. Read the initial post here. Today’s photographers are Jon Lee, Scott F. Hall, Christopher Manson, Lauren Mosinka, and William Hundley. I selected the concept because its impermanence works well with the One Hour Photo concept. I selected the image itself because of it’s starkness and meditative quality. Basically, it’s something I want to stare at for an hour. The quality of the photograph was not as important as the consideration I paid to it’s content. Much like the concept behind “One Hour Photo”, the television set (my photograph depicts a gold television set) has attained a dream-like status different from any other object in the world. With a flick of a switch, we are able to engage in a “truer than”, but also more fleeting experience of everyday reality. It is this transitory notion that I felt was in keeping with the ideology behind “One Hour Photo”. Nothing is really lost anymore. The human desire to fragment, codify, classify and control is a powerful one; from private family photo albums, to public libraries, and online photo archives, systems of organization both public and private surround us. Lost cultures survive in museum collections and photographs hold passing moments frozen in time. Despite the abstract nature of “One Hour Photo’s” temporary archive, I believe that the obsessive way at which people claim parts of culture as their own will see that my photograph will live on. Larissa Leclair has teamed up with One Hour Photo to feature photographers from this exhibition. Read the initial post here. Today’s photographers are Shane Lavalette, Vicki Sher, Chandi Kelley, Borislav Alexandrov, and Peter Zachary Voelker. It’s a difficult process at first, which I’m sure I wasn’t alone in struggling with. That said, once I came across the photograph I knew it was the one. For myself it was important to find an image that was not only appropriate for the context of the exhibition but perhaps also strengthened by it. I think that’s how I’m able to justify “letting go” of it. It is important to want to create a Moment -for your subject and the photo – rather than thinking of the piece as an object. It is more performative. It’s difficult – even though I have other pictures of my son, and other versions of his school photo, but this one is good…it feel like a loss. For me, this image captured a rare and magical moment that, through the photograph, became true in a sense. If one tried to describe the moment portrayed, its possible no one would believe it. The proof lies in the photograph â€“ the documentation of the moment. In choosing this image to be seen only once, and never again, I return it to a mythical place. Everyone who sees it becomes witness to a rare moment that they can only describe but not prove. I felt that in the context of One Hour Photo, this image says more than it does on its own. It has been more difficult than I anticipated. As soon as I submitted this image, it became imbued with a sense of importance. As if the act of letting it go, made it something to be cherished. Larissa Leclair has teamed up with One Hour Photo to feature photographers from this exhibition. Read the initial post here. Today’s photographers are Yasmine Soiffer, Ryan Boatright, Alex Kisilevich, John James Anderson, and Kalle Kataila. It was a strange thing! I thought about it. Generally, you pick an image that is your best work, because you want to show it. Here, it was an interesting tension between picking a piece that was worthy, but that I could accept not showing again. Ultimately, the concept appealed to me and I wanted to participate. I wanted to create a piece that was about loss, so it was very fitting, the work fits the concept and the exhibition. The image that I sent in is of a snowman on the beach. I was thinking about the things that you do not get to keep, in terms of loved ones, and happened upon this snowman, melting into the sand at the beach, a strange marker, another thing that cannot be kept. By selecting works that illustrate various perspectives on memory, permanence, and the nature of photography. The way in which this piece functions in the context of this exhibition is appropriate. I treated the selection for this exhibition with the same regard and significance as with any other exhibition I have been a part of. In the process of selecting a photograph, the idea of the image fading in and then out, along with the notions of â€˜fleetingâ€™, â€˜permanenceâ€™ and â€˜disparate memoryâ€™ were all considered. The final image represented all of these ideas. I am definitely attached to the image I submitted but it is so refreshing to be part of this unique exhibition. One Hour Photo removes the commodification aspect of photography in a gallery setting. It is art for artâ€™s sake and because of this, letting go of an image I am attached to, is completely worth it. I thought of an image that would reflect the concept of the exhibition. Four people live in Death Valley Junction, and I have no clue how many people attend a performance at the Amargosa Opera House, or take refuge in its hotel each year. What I do know is that there are many ghost towns that dot the land around Death Valley National Park, and Death Valley Junction has the potential to join that fraternity of abandonment. I had a professor in undergrad, Brenda Jones, who emphasized that nothing in art is precious. Besides, the concept of this exhibition outweighs the photograph. Larissa Leclair has teamed up with One Hour Photo to feature photographers from this exhibition. Read the initial post here. Today’s photographers are Geoffrey Pugen, Jeroen Nelemans, Isaiah Headen, Rafael Soldi, and Jennilee Marigomen. I promised myself that if I was not selected I would make a large light box of the image. I am very excited to be part of the show, but now I am longing for the light box. You want the experience of that moment to be enough to leave an impact for a lifetime. I will probably spend my life time taking photos of this woman. I think I can spare one. I revisited a recent contact sheet and found an image that I originally though was faulty. After looking at it I found a beauty in it that I hadn’t seen before and if it wasn’t for this exhibition I would’ve never see again. So I thought it was appropriate. It’s hard to do!! Images are my language. But there are many images that I always wished I’d taken and never did and hopefully many more great images to come! Larissa Leclair has teamed up with One Hour Photo to feature photographers from this exhibition. Read the initial post here. Today’s photographers are Chris Eichler, Lucas Blalock, Jason Lazarus, Sean Newman, and Marissa Long. I wanted an image that spoke somehow to the theme of transience of the One Hour Photo exhibit, and one that was worth meditating on for an hour, but which I had not invested too much time into. This picture has a multi-layered, diaphanous quality which rewards slow viewing. I do like the the image a lot and will be sad to see it go. I would like to shoot more photographs along the lines of this one. I have always been interested in the eerie things that light does, which can as surreal as any photoshop or darkroom inventions, and which speak to me of the strangeness of life. I will have to work to make or find more such light and build on what this image if for me in new pictures. But of course, none of them will ever be quite like this one. My practice often creates multiples, rethought and reworked ideas. This picture was a favorite of mine a few months back that became sort of singular and didn’t commune as well with the others. I wanted to use something both iconic and temporary (in subject) and it fulfilled both. In the end it seemed an obvious choice. I feel okay about it. It’s a tricky endeavor! I think it fell into place for me without too much fuss because the themes that the One Hour Photo curators were interested in made me think right away of an older series of mine. The image I ultimately submitted is an alternate/outtake image I’d never shown before with that series, but had always liked a lot. I guess the decision was easier, too, because it feels so different from work I’m moving towards and making now. I work and accumulate images pretty slowly, so in some ways “letting go” of even one image feels like a lot. But overall, it’s a liberating practice. This is an image I’d cared about but partly forgotten for a while, and I have this notion that it went from feeling neglected to feeling glamorous! It’s becoming more visible and more elusive at the same time – I like that. 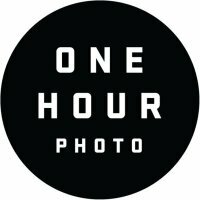 One Hour Photo is a smart, exciting project, and I’m honored to be included. Larissa Leclair has teamed up with One Hour Photo to feature photographers from this exhibition. Read the initial post here. Today’s photographers are Chad Dawkins, Alex Wein, Belinda Haikes, Mark Regester, and Dean Valadez. The same way one goes about selecting anything. Almost anything is worth seeing once, very few things are worth seeing again. My thoughts on letting go of this image supersede my feelings about keeping it. This photograph was an alternative angle from one of the pieces I shot for my Dreamscapes series in 2009. I ended up not using it as the final image but still thought the photograph was strong. Since it wasn’t used as the final image, I’m okay with only exhibiting this piece once because I never even thought it would be seen in a gallery. I have been working with a series of photos I took from the car as I drove across country for a while now. The images come into and out of my practice, taking different forms. Each photo in the series has an odd, antiquated feel to them, which is due to the point and shoot camera that was used. In a way you can feel that it is a bad film camera. I decided this was the series to draw from, to capture the fleetingness of the image, to reinforce the meaninglessness and specificity of the photographic image in the digital age. Taking materiality of increasingly obsolete technologies and allowing them to become metaphorically obsolete was really appealing to me. Letting go of the image, and the values we project onto them can be hard. It kinda reminds me of the old joke from undergrad, the one where we question if an artist draws a â€˜masterpieceâ€™ on a napkin with water, is it art? Is it art if it no longer exists? I think that is what really drew me to this curatorial project, it forces the artist to think about the value of permanence in the digital age, while forcing us to deal with it on a personal level too. I was going through a bunch of old photos and found this image that I had forgotten about. I had always wanted to use it for something but never had the right project, this seemed like just the thing. Plus it just seems to me that the image would look good projected on a wall. This is such a wonderful, intriguing concept for an exhibition. I’m honored to be a part of it. I’m thrilled to let it go. There are bazillions of photos waiting to be taken, why be precious? This was admittedly difficult. I ended up arguing and then reasoning with myself and realized that I do similar things already with my paintings and collages, which tend to exist in one form for quite some time until I eventually see how they should exist as something else. Many of my works – paintings, photos, prints, videos – have their own life for a year or two before becoming hybridized or cannibalized into their new identity: I will cut them up to collage them, repaint them, or re-edit them in some sort of way. Most of the time, the general public never sees the original form of my artwork. What is on my website and what is shown in galleries is always typically the altered variant. This sort of continuous rediscovery of how something should be finalized questions the finalization process; I realized that this natural response to my work has become its own process. So what I found would work best is an image that has a strong ground – a ground, so to speak, to what I anticipate will be future works; a sort of scaffolding or armature for what may come after it, but where the armature itself is still an interesting form that if the building were never built, the armature has a reason to exist on its own right. But also, should the grand architect decide to continue building upon the armature, the figure has a ground upon which to exist, even if that ground should be lost and not seen. Thus, knowing that I will never see ‘Game Show Contestant’ again is already familiar – a bit unpleasant right now, perhaps, but, nonetheless, familiar. I initially was hesitant to submit work for the show due to this reason. Yet, due in part to my pre-existing conceptual structure, which itself envelopes mediating technology and their resultant images, I felt the conditions of the exhibition buttressed the notion of fleeting imagery commonplace to everyone who encounters a screen. We all let go of our screen imagery. This temporal position of imagery only made sense for my work. Larissa Leclair has teamed up with One Hour Photo to feature photographers from this exhibition. Read the initial post here. Today’s photographers are Yael Ravid, Jordan Tate, E. Brady Robinson, Damon Zucconi, and Mohammadreza Mirzaei. so I when I was trying to think what to choose I looked again at some photos I took in the past year that for some reason were not included in the final choice for this series. I remembered this location and how I planned to go there for several months until it actually happened and I remembered how I enjoyed taking pictures that day. I figured if I am that sentimental about the location and memory of being there it is the perfect choice for the One Hour Photo Project. I must say letting go is easier than expected, I do see myself as a sentimental person…. But, the idea that my picture will be projected without my presence and without knowing if anyone will actually see it – I think its a way to spread one piece of myself out there. However, of course I do hope to have an audience. It is actually really difficult. I wanted to pick an image that conceptually related to one of my most successful works yet did not rely on that image for its success. If, after attending One Hour Photo, someone would see my other works, I hope that they would find them vaguely familiar without recalling any specific work. That was one of the major keys for me, I wanted to have the image be ephemeral, but not the concept. It was surprisingly easy. While it is the first image I have deleted in any form in a very long time, my work generally functions as a meta-photographic critique and as such, conceptually relating my actions to such an interesting curatorial concept was exciting rather than unsettling. I committed to the project when I submitted the image. After I sent my work to Adam, Chajana, and Chandi, I deleted the files associated with that image. I wanted to participate in this exercise regardless of my acceptance in the show. This particular image titled â€œGustavoâ€� is private and intimate and does not necessarily fit in any current series. The image I chose would not work in a larger solo exhibit of sequential images, it stands alone as a singular photograph. This is an image I hold dear in my heart. It is a photograph of my husband. I love this image of him and clearly remember this moment of riding in the back seat of a car while passing through the streets of Mexico City. Such an image is perfect to show in an exhibit such as One Hour. The ephemeral nature of the exhibit goes well with the fleeting nature of this image and allows me to share with a larger audience, if only for a fixed moment in time. One Hour Photo allows photographers to share and celebrate fleeting moments and the singular image. One Hour Photo is self-reflexive and allows the viewer to contemplate on the nature and essence of photography itself and itâ€™s relationship to memory and the split second of time when an image is captured. I let many images go. It was exactly the motivation to participate in this project. I have an intimate but complicated relationship with this one. This photo is significant for myself; the photo itself and its capturing moment and its object. But at the same time, I was trying to find a way to not be able to share it anymore. Now Iâ€™m feeling well but Iâ€™d be able to answer this question much better after the show. You are currently browsing entries tagged with Katzen at Larissa Leclair.